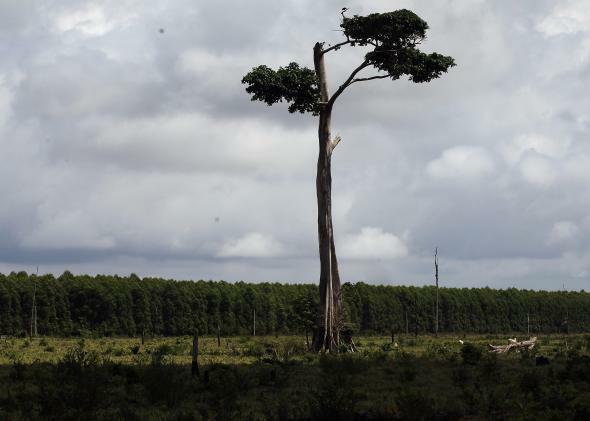 A lone tree stands in a deforested section of Amazon rainforest. The result, published today in Science, is a stunning series of time-lapse maps, along with an interactive mapping tool, that reveal the Earth lost about 888,000 square miles of forest between 2000 and 2012, roughly the area of the U.S. east of the Mississippi River. The loss, which was most dramatic in the tropics, was primarily due to logging, urban development, strip mining, and other human impacts, Hansen said, but the figure also includes loss from fires, earthquakes, and other natural disasters. The maps are accurate to 11-square-mile units, close enough to see logging roads and individuals stands of trees, which gave the researchers an unprecedented look at the complete extent and rate of deforestation on a global and hyper-local scale. In the video above, Hansen takes us on a tour of his new maps and the startling situation they reveal. The data could be used to track the impact of forest protection policies and hold a microscope to the forested areas most at risk. One of the next steps, Hansen said, is to use the data to gauge exactly what this deforestation means for climate change. Trees are one of the largest “sinks” for carbon dioxide; previous studies suggest forests absorb a third of the carbon released by burning fossil fuels.